Run a “clean” campaign with a custom hand sanitizer! This 2 Oz. 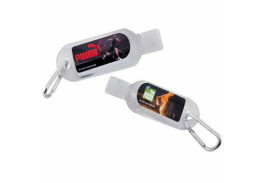 custom hand sanitizer gel is FDA approved, and comes with a carabiner so you can clip it and go! With your logo imprinted in full color on a clear label on the front, and pre-printed ingredients on the back, you have a winning promotional item customers will appreciate.